Preheat the oven to 350°. In a large enameled cast-iron casserole, melt the butter in 1 tablespoon of the olive oil. Arrange the meat in the casserole in a single layer and season with salt and pepper. Cook over moderately high heat, turning occasionally, until browned on all sides, 8 minutes. Add the chopped onion and garlic and cook over moderate heat, stirring occasionally, until the onion is softened, 5 minutes. Add the flour and stir to coat the meat with it. Add the wine, bay leaves and thyme, season with salt and pepper and bring to a boil, stirring to dissolve any brown bits stuck to the bottom of the pot. Cover the casserole and transfer it to the oven. Cook the stew for 1 1/2 hours, until the meat is very tender and the sauce is flavorful. Meanwhile, in a saucepan, cover the pancetta with 2 cups of water and bring to a boil. Reduce the heat and simmer for 30 minutes. Drain the pancetta and slice it 1/2 inch thick, then cut the slices into 1-inch-wide lardons. 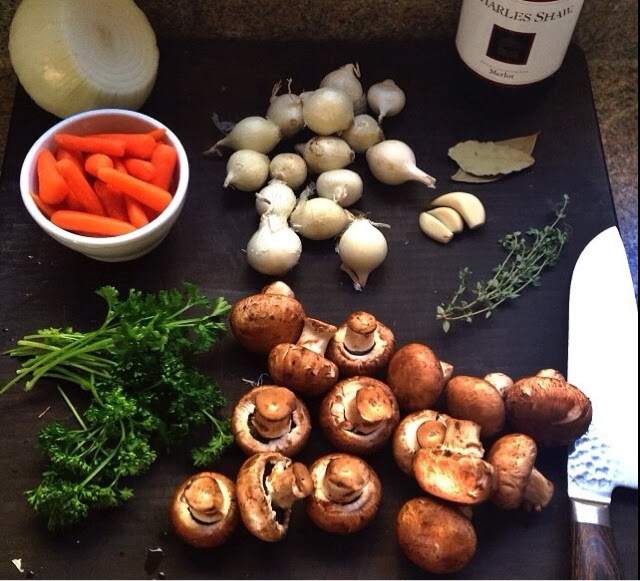 In a large skillet, combine the pancetta, pearl onions, mushrooms and carrots. Add the remaining 1 tablespoon of olive oil, 1/4 cup of water and a large pinch each of sugar, salt and pepper. Bring to a boil, cover and simmer until almost all of the water has evaporated, 15 minutes. Uncover and cook over high heat, tossing, until the vegetables are tender and nicely browned, about 4 minutes. To serve, stir some of the vegetables and lardons into the stew and scatter the rest on top as a garnish. Top with a little chopped parsley and serve. SUGGESTED PAIRING Robust, dark-fruited Cabernet Sauvignon.